This article is about the person in some South Asian religions. For other uses, see Rishi (disambiguation). Rishi Vishwamitra In above image, Menaka trying to win him over from an aloof ascetic life to a householder life. According to Indian tradition, the word may be derived from two different meanings of the root 'rsh'. Sanskrit grammarians derive this word from the second meaning: "to go, to move". V. S. Apte gives this particular meaning and derivation, and Monier-Williams also gives the same, with some qualification. Another form of this root means "to flow, to move near by flowing". (All the meanings and derivations cited above are based upon Sanskrit English Dictionary of Monier-Williams). Monier-Williams also quotes Tārānātha who compiled the great (Sanskrit-to-Sanskrit) dictionary named "ṛṣati jñānena saṃsāra-pāram" (i.e., "one who reaches beyond this mundane world by means of spiritual knowledge"). More than a century ago, Monier-Williams tentatively suggested a derivation from drś "to see". Monier-Wiliams also quotes the Hibernian (Irish) form arsan (a sage, a man old in wisdom) and arrach (old, ancient, aged) as related to rishi. Monier-Williams also conjectures that the root drish (to see) might have given rise to an obsolete root rish meaning "to see". Modern etymological explanations such as by Manfred Mayrhofer in his Etymological Dictionary leave the case open, and do not prefer a connection to ṛṣ "pour, flow" (PIE *h1ers), rather one with German rasen "to be ecstatic, be in a different state of mind" (and perhaps Lithuanian aršus). Some of the earliest lists of Rishi are found in Jaiminiya Brahmana verse 2.218 and Brihadaranyaka Upanishad verse 2.2.6. A temple relief showing a Rishi. In the Vedas, the word denotes an inspired poet of Vedic hymns. In particular, Ṛṣi refers to the authors of the hymns of the Rigveda. Post-Vedic tradition regards the Rishis as "sages" or saints, constituting a peculiar class of divine human beings in the early mythical system, as distinct from Asuras, Devas and mortal men. Swami Vivekananda described "Rishi"s as Mantra-drashtas or "the seers of thought". He told— "The truth came to the Rishis of India — the Mantra-drashtâs, the seers of thought — and will come to all Rishis in the future, not to talkers, not to book-swallowers, not to scholars, not to philologists, but to seers of thought." The notable female rishikas who contributed to the composition of the Vedic scriptures are: The Rig Veda mentions Romasha, Lopamudra, Apala, Kadru, Visvavara, Ghosha, Juhu, Vagambhrini, Paulomi, Yami, Indrani, Savitri, and Devayani. The Sama Veda adds Nodha, Akrishtabhasha, Sikatanivavari and Gaupayana. In Mahabharata 12, on the other hand, there is the post-Vedic list of Marici, Atri, Angiras, Pulaha, Kratu, Pulastya and Vashista. The Mahābhārata list explicitly refers to the saptarshis of the first manvantara and not to those of the present manvantara. Each manvantara had a unique set of saptarshi. In Harivamsha 417ff, the names of the Rishis of each manvantara are enumerated. In addition to the Saptarṣi, there are other classifications of sages. In descending order of precedence, they are Brahmarshi, Maharshi, Rajarshi. Devarṣi, Paramrṣi, Shrutarṣi and Kāndarṣi are added in Manusmriti iv-94 and xi-236 and in two dramas of Kālidasa. The Chaturvarga-Chintāmani of Hemādri puts 'riṣi' at the seventh place in the eightfold division of Brāhmanas. Amarakosha (the famous Sanskrit synonym lexicon compiled by Amarasimha) mentions seven types of riṣis : Shrutarshi, Kāndarshi, Paramarshi, Maharshi, Rājarshi, Brahmarshi and Devarshi. Amarakosha strictly distinguishes Rishi from other types of sages, such as sanyāsi, bhikṣu, parivrājaka, tapasvi, muni, brahmachāri, yati, etc. 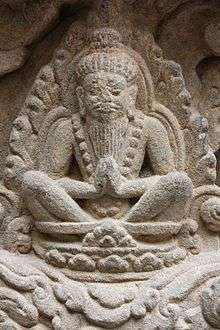 Most medieval era Hindu temples of Java, Indonesia show Rishi Agastya statues or reliefs, usually guarding the southern side of Shaivite temples. Some examples include Candi Sambisari and the Prambanan temple near Yogyakarta. Rishi Agastya is known as Phra Reusi Akkhot in Thailand. Ruesi (Sanskrit: ṛṣi, Thai: ฤๅษี) is a hermit sage, the equivalent of Rishi in India. 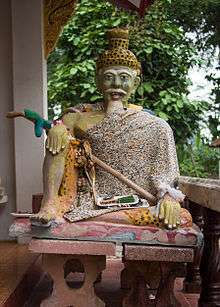 He is a figure of many legends and stories of the Lao and Thai folklore. The Ruesi are Hermit sages who spend their time meditating and developing psychic powers and collecting magical herbs, minerals, rarities and other substances. They use the magical ingredients to make special love charms, spells and protective amulets. They wish to help other beings to be happier in life, and do this by telling fortunes, making rituals and spells to reduce bad karma, chase evil influences and spirits away, protect from ones enemies, or even increase one’s luck and wealth with a spell for wealth and good fortune. Some Rishi wear a reddish-brown robe, whereas some even wear white like the Prahm. Some wear white and devote themselves exclusively to healing medical ailments. This kind of Ruesi is known as Chiwok, named after the Rishi Chivaka who was the official doctor of the Lord Buddha. A Chiwok Ruesi would collect herbs minerals and healing substances for making his healing potions. This kind of Ruesi can perhaps be compared to the druid bards who were also healers, using herbal potions and ointments. A Chiwok Ruesi will also be expert in orthopedic massage, and other matters, such as Horoscope. Of the types of Ruesi who make Sak Yant, most will be of the Dabos variety, such as Ajarn Thoy Dabos (there are many other subcategories of Ruesi within the main variety who wear reddish robes). The Dabos will sometimes also wear a tiger skin over his red robe, because of the tiger skin worn by Lord Shiva, who was and is the original Maha Ruesi (great Ruesi). A Dabos Ruesi will normally have at least one Ruesi mask of the Thai Deity “Ruesi Por Gae Dta Fai” on his altar. Most of the Ruesi in modern Thailand are of the "Dabos" type, and are not required to keep vows of sexual abstinence or poverty. Indeed, modern Ruesi often have a nice car, mobile phone, are married, and have children. The only requirement for such Ruesi is that of magical knowledge and psychic ability (having developed these qualities in meditative states). Rishi is also a male given name, and less commonly a Brahmin last name. In Carnatic Music, "Rishi" is the seventh chakra (group) of Melakarta ragas. The names of chakras are based on the numbers associated with each name. In this case, there are seven rishis and hence the 7th chakra is "Rishi". The descendent families of these Rishis, refer to their ancestral lineage through their family "gotra". This is a common practice among the Brahmin sects of the current Hindu society. ↑ "Swami Vivekananda on Rishis". Swami Vivekananda Quotes. Retrieved 12 April 2014.